From the River Cafe Easy cookbook, which is full of really simple but fabulous dishes. 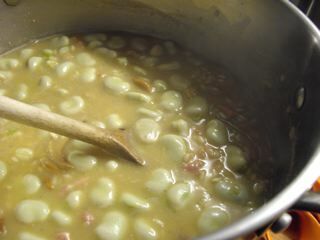 They rely heavily on the best ingredients with each recipe highlighting a key ingredient, in this case broad beans which are slap bang in season right now. Julie thought we’d cooked this before and the grease stains on the page were a giveaway. We really fancied some comfort food after it had rained solidly all Saturday and I don’t think you can beat a Risotto to cuddle up to. Washed down with a very bottle of Corallillo Chilean Chardonnay from M&S (which Julie scored highly due to its creamy oakiness) it was a perfect Saturday night supper.